Bouchér Photography: Vegas WPPI 2008! The recap. Vegas WPPI 2008! The recap. Let's start things off right shall we? Well, not really. We heard a weird noise while driving before even getting on the freeway from San Diego so I thought it wouldn't hurt to go to the nearby tire store because it sounded like a flat. Well, I came to find that our tires were way too bald to risk driving to Vegas with it fully loaded. So with new tires all around we were on our way finally, just a mere $660 dollars later! This is Crystal being optimistic after having a full glass of red wine spilled on her by our lovely waitress at restaurant with lame service in the Planet Hollywood Hotel. Poor Crystal, she didn't deserve that; or me blogging it for that matter...whoops. This is right before we were going in to see KA at the MGM Grand. Compliments of Sean and Kevin from KISS Wedding Books (www.KissWeddingBooks.com), you guys flippin' rock! Thank you! It's a seriously good show, not better than "O", but different and unique to itself. 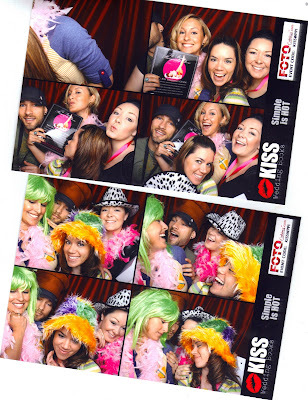 The other shot is a compilation of photo booth shots from Kiss' hip photo booth that they had at their WPPI booth. Here we are after seeing "O" at the Bellagio Hotel. WOW is all I can say. The scents, the sights, the performers, unbelievable. SEE THIS SHOW in your lifetime. They had to kick us out after the show because we just wanted to sit there and marinate in the experience. Here we are hanging out at New York New York Hotel with the guys from KISS Wedding Books along with some other awesome photographers such as Mike Larson (you rock!). Drinks were on KISS, again thanks you guys! Kimee, me, and Marissa wishing we had a time machine after bloating ourselves with Del Taco. Here are our 3 lovely employees (that's sounds so impersonal, you guys are such blessings) Crystal, Kimee, and Deena at the Bellagio Piano Bar. This is Carlos Baez who was kind enough to befriend us, take us under his wing, and share some of the awesome advice and insight he had to offer. If you ever get a chance to hear him speak, definitely check him out. He spoke at Graphi Studio's booth and at the Adobe booth which we both attended and loved. This is inside the Celebrity Suite inside the Palms hotel. It was a sweet industry party put on by Pixel to Canvas and Flo Sites. Thanks for the invite guys! Ross, looking forward to working with you ASAP. We also got to attend the insane BluDomain and KISS party at a Las Vegas mansion called "Paradise Palace". It was like being on an episode of MTV cribs, seriously. All the big names were there like Mike Colon, Jeff Woods, Jesh De Rox, and I even got to meet the drummer from LA Slumlords whose song appeared in Guitar Hero III! I love that game! Rockband is taking up my evenings lately though. Marissa and I are called "The Butchers" and we are currently on tour. Here we are at the WPPI Canon welcoming party. Pretty cool but it was so huge that it was hard to get to know anyone. Okay, so people think that PURE at Caesar's Palace is one of the best clubs in Vegas? Ha! That place is all hype and they think that you should be touched by God (or Satan) to enter their mighty gates. Scoff, that place is lame compared to The Bank at the Bellagio. Better sound, better crowd, better staff, better layout, better DJs, period. By the way, hit up the Bellagio Cafe for the best belgian waffle you've ever had or try the Eggs Benedict for a flavor blast on your tongue. One of our favorite seminars that we took was by Matthew Jordan Smith who was a frequent photographer on America's Next Top Model. What a seriously sharp guy who made success a reality by going after it and not taking no for an answer. Other seminar highlights included Yervant of course and Hernan. Me and Marissa with Eileen Rafferty from Collages.net. Meghan and her are so good with people, I don't think there's anyone better for a face of a company than them. We've been hosting our proofs with them for a couple years now and haven't looked back. They offer some awesome Gallery Wraps too. Great color accuracy and construction. They've been kind enough to feature some of our images on their homepage, albums , gallery wraps and at their convention booths. We got a chance to dance at Studio 54 at the MGM Grand but it took some major coaxing on my part. Looking back I thought that was weird because usually I have to be forced to dance but I don't know what it is about Vegas that just makes me feel totally relaxed dancing horribly in front of spectacular dancers. So this guy in the middle here was the highlight of the night. I would love to know his story. My guess is that his grandson didn't want to watch him so he gave him his hip, stylized hoodie sweatshirt and said "this is studio 54 grandpa, now go have fun!". Everyone in the club loved this guy because he would shamelessly dance with all the girls, for hours at a time. We know because we danced our butts off at this place. Good times. 'Til next year! 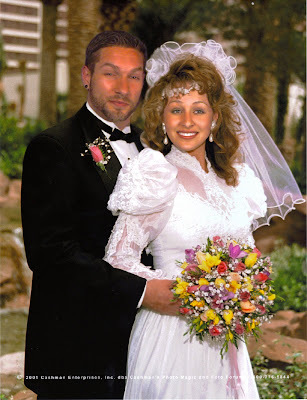 That photo of you two in the 90's wedding outfit is outrageous. Westin you have this axl rose thing going. I'm off to live in Guam in August. I hope to see you guys at the WPPI next year. I'm going to try my best to come back for it. Keep it up guys. Your photos are looking amazing! Lily & Chris at La Jolla Cove! Yoko & Shane at the Grande Colonial in La Jolla!